Bath towels come in many different sizes today. 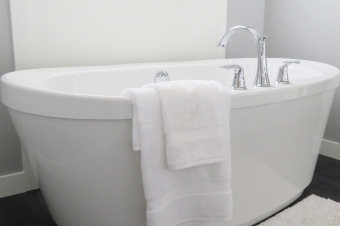 Regular Bath Towels measure around 27” x 52” while Bath Sheets measure larger at 35” x 60”. Hand Towels are your much smaller towels and measure around 16” x 30” while Wash Cloths normally measure around 13” x 13”. You may think cotton is cotton no matter where or how it is produced. However there are many different types of cotton that can change the feel and use of a towel. Standard Cotton is typically used for everyday towels, while Turkish Cotton is composed of longer fibres and therefore comes with better durability and a softer more luxurious feel. Many people choose Turkish Cotton if they want a thicker heavier towel. Turkish Cotton also becomes softer and fluffier with every wash. You may also hear the terms Supima Cotton when searching for towels, supima cotton is grown in the United States and is a shorter thread but a higher quality towel that will definitely last a long time. Egyptian Cotton is the best type of cotton and is often considered the softest and most absorbent type of cotton. All towel weights are measured using Grams Per Square Meter known as GSM. This number can vary between anywhere from 200 GSM to 900 GSM. Your 200-400 GSM towel is lighter, and easier to dry. Towels measuring 600-900 GSM are considered more luxurious and thicker but also require additional drying time. Creating the perfect balance of weight with a towel is what makes our towels extra special. We put tons of thought into our towels how they are composed and how they will be used. You may hear the term two-ply or one-ply towels when searching for the perfect towel. Two ply towels are longer lasting and more durable than your single ply towels. So try and look for two ply towels. Colour and style is a personal choice. We like our rounded corner towels for children as they are easier and safer to use than strong cornered towels. White towels we find the easiest to maintain and the most spa like. As designers we always recommend giving children their own coloured towel so they stick to using their towels instead of the siblings towels. This makes identifying easier. Before using your towels you should always wash them. This helps solidify colour and will help to improve the absorbency.Just like all of our linens we highly suggest avoiding the use of any fabric softeners as they tend to leave a film of residue that can decrease the absorbency of the towel. Most towels are 100% cotton and therefore will shrink if you do not use the proper dryer setting. We always recommend shaking towels out once you take them out of the washing machine to organically keep their fluffiness prior to placing them in the dryer. It is okay to use dryer sheets (however they can weaken your towels absorbency over time) with your towels which will add a bit of softness during the drying process. Always wash white towels separate from other colours and remember to separate dark colours from light.